Zebra Lounge, Enology Wine Bar, and Alliance Tavern have all occupied 3238 Wisconsine Avenue NW in the last two years. 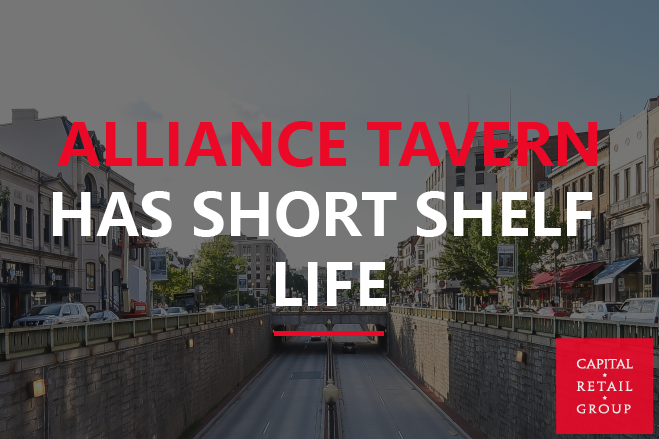 Enology ownership didn’t have the results needed for sustained success so they changed concepts to Alliance Tavern adding a new and different menu and chef to attract more customers. The Washington Post reviewed the local tavern recently but apparently it was too little too late. Alliance Tavern is now closed for business. The space is located at the corner of Wisconsin and Macomb with good visibility and nice finishes. Most likley a new concept will reappear in the coming months under new ownership…again. Can Tenants Going South Be Turned Around?